Amy O’Neal and her team of B-Boys broke new ground for concert dance and for hip hop as an art form with Opposing Forces this weekend at On the Boards (October 23-26, 2014). 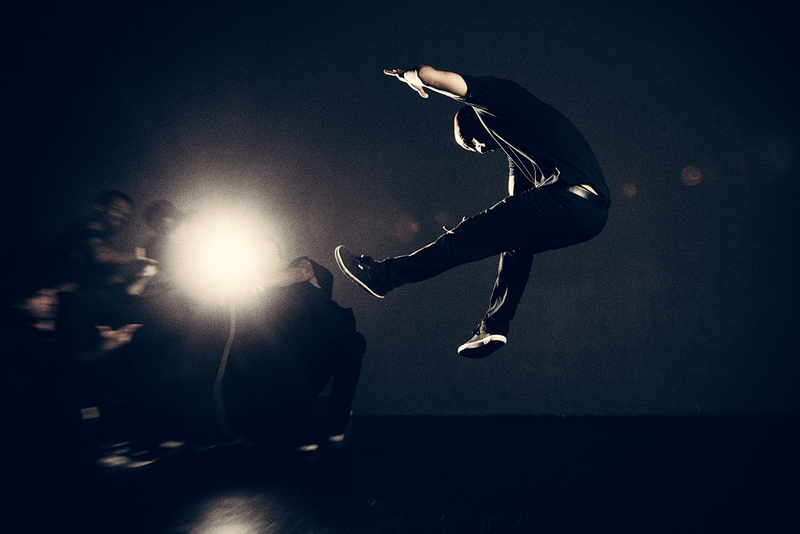 Hip hop and B-boying have a long history stemming from the streets and gangs of New York in the early 1970s; both have evolved as social dance forms, used to build community and establish status within it. Conversely, contemporary concert dance has made a strident effort to make important, intellectual statements on many aspects of human life while existing in a realm separate from day-to-day living. 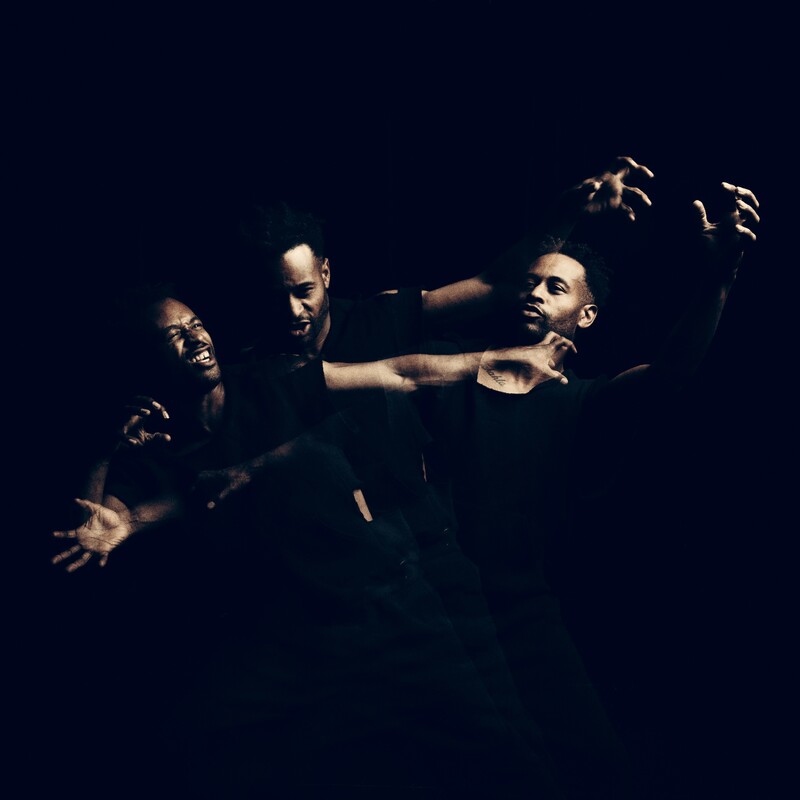 With this show, O’Neal brings the two forms together with finesse, using an all-male B-boy cast and traditionally masculine style of dance to explore the constructs surrounding femininity. The work manages to touch on a number of broader issues in the process. In execution, Opposing Forces proved itself an extraordinary collaboration, not just between O’Neal and the dancers, but also in every aspect of the technical development. DJ Waylon Dungan (WD4D) provided excellent beats and created new musical landscapes for each section. However, it was the partnership between Amiya Brown’s lighting design and Ben Zamora’s set that stole the show. Zamora’s design of interlocking geometric patterns (boxes, triangles, ‘x’s, and eight-pointed stars) on the floor and backdrop set an incredibly adaptable scene, especially in tandem with the lighting. Brown’s lighting transformed the space time and time again, from sharply focused spots flashing tiled patterns reminiscent of disco clubs to bright washes of light revealing vulnerabilities. Arguably, these elements upstaged even the superb dancing, highlighting each section so specifically and effectively that they became ingenious works of art on their own. Pumping music greeted the audience as they entered the building, and the overflowing theater made it apparent that the party had already started. Cast members as well as select members of the audience—adults and children alike—jammed it out on the dance floor. Once they dispersed, a dance battle kicked off the show. With showy tricks and fast footwork, competing crews of men challenged each other to prove their masculinity with amiable brazenness. The solo work here relied on risk—footwork so quick it made them stumble, handstands taken with so much force they threw themselves onto their backs—every movement and decision made with wild abandon in the heat of the moment. This high-energy, forceful, and confident risk-taking became the benchmark for masculinity in the piece. As the battle ended, Michael O’Neal Jr. struck out on his own, initiating a set of slower, smoother movements—a quality considered feminine and therefore weak in B-Boy culture. But in dim blue light, M. O’Neal’s slick body rolls appeared the opposite, displaying an ultra-masculine sensuality that drew plenty of sighs. As the audience admired his sculpted form in motion, a recorded interview revealed his insecurities with body image, providing a moment of vulnerability that asked the audience to consider the meaning of femininity. The juxtaposition of this section with the battle accentuated the distinction between the sharp masculine and soft feminine qualities, which blended more and more into a spectrum of grays as the show progressed. The following sections illuminated the struggles men face with cultural expectations in single fatherhood and male friendship, as well as the propensity for men in hip hop culture to get into trouble with each other and with the law. These scenes were played out by a core cast of five talented men. One duet between MozesLateef and Fever One involved robustly intimate partnering that required both trust and power. What started as a brotherly spat grew more dangerous with every pass, finally coming to a tragic end. Fever One’s following solo, a regretful spiral from the fight into crime and jail-time, was accompanied by a history of the violent roots of B-boying that was as educational as it was powerful. MozesLateef also stood out in a solo accompanied by his daughter’s voice, directing his movements inside a tiny box of light. The experiences of single fatherhood were deeply embedded here, from questioning the traditional gender roles of parenting to reflecting on the way children shape their parents’ lives. The costuming by Wazhma Samizay and Daniel Hellman stood out in two of the most striking sections, in which the dancers wore dark hoodies pulled over their eyes and face. The first of these scenes was ultimately terrifying. Save for a box of light upstage that illuminated nothing beyond its sharp edges, the stage completely darkened and the hooded figures appeared as ominous apparitions. As an audience member, suddenly sensing a group of four looming figures mere feet away brought the dread of gang violence to life. The second touched on the rare, often condemned presence of women in the B-boy world. The masking hoods and tight, unison choreography made it all but impossible to distinguish the identity or gender of the mysterious sixth dancer onstage. This, combined with the powerful female vocals of Gifted Gab, made for one of the evening’s most powerful statements on the distinction between the masculine and the feminine—there isn’t any. Opposing Forces is a show that should run much longer than one weekend. Its artistry and contributions to the cultural conversations of urban life should not be missed. Luckily, Friday’s performance was filmed for Ontheboards.tv, which will eventually make it available online at a price point much lower than the theater. When that happens, don’t miss the opportunity to watch it. In the meantime, find out more about Amy O’Neal and Opposing Forces here.